On September 18, 2016, about 1118 Pacific daylight time, a tailwheel equipped experimental amateur built (EAB) Hoover Arnold AR-6, N616DH, struck a tailwheel equipped EAB Reberry 3M1C1R, N913FT, during the takeoff roll at the Reno-Stead Airport (RTS), Reno, Nevada. The airline transport pilot, in the AR-6 was not injured and the airline transport pilot in the 3M1C1R, sustained minor injuries. The AR-6 was registered to the pilot and operated as Race 11. The 3M1C1R was registered to Hot Stuff Air Racing LLC., Kissimmee, Florida, and was operated as Race 1. Both airplanes were operated by the pilots under the provisions of Title 14 Code of Federal Regulations Part 91 as an air race flight, which was originating at the time of the accident. Visual meteorological conditions prevailed and no flight plan was filed for either airplane. The race heat consisted of 8 airplanes, each positioned in a staggered formation on the runway. 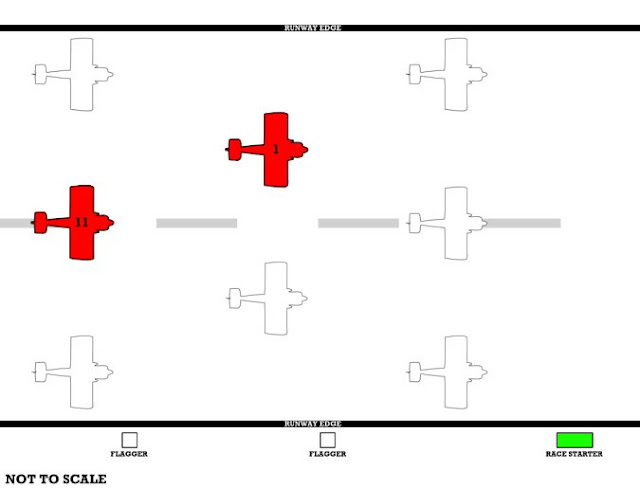 Figure 1 depicts the position of each airplane prior to the race start. Flaggers were located to the right of each row on the runway edge. Additionally, a race start flagger was located on the right side of the runway, in front of the first row of airplanes. Prior to the race start, all of the airplanes are at takeoff power, waiting for the race start signal. The race start is signaled by the race start flagger raising and subsequently dropping a green flag along with flaggers on the second and third row raising and dropping white flags. The pilot of Race 11 reported that he was in the back row of the Formula 1 staggered start sequence on runway 8. Once he saw the green flag for start, he initiated takeoff and observed both airplanes to the left and right of him accelerating faster than he did. As the tail of the airplane came up, the pilot observed Race 1 stationary on the runway and he attempted to swerve out of the way and get the airplane airborne. Subsequently, Race 11 impacted Race 1. The pilot of Race 1 reported that he was in the number four position, which was located in the middle row, inside position. He stated that when running the engine up in anticipation of the start, about 20 seconds before the green flag drop, the engine was not running well enough for flight and he made the decision to shut the engine down to signal the starters to halt the starting process. The pilot recalled that a flagman on his row put his hands in an 'X' over his head and he decided to open his canopy to make it clear he was out of the race and so everyone could see him. The pilot further reported that an alternate airplane was signaled to taxi on to the runway to replace his entry and that he felt confident the communications had reached the appropriate people as he waited for personnel to push his airplane off the runway. The pilot stated that shortly after, he saw the flagman run out on to the runway waving his hands over his head as if something was wrong and observed the airplane to his right start his takeoff roll. A few seconds later, Race 6 and Race 8 passed by him on either side, and subsequently, he was impacted from behind. A completed Pilot/Operator Aircraft Accident Report Form (6120.1) was not received from the pilot of Race 1. The race starter, who was standing in the rear bed of his truck during the start of the race, reported that he observed all of the Formula One aircraft engines running in all three rows. Prior to raising the green start flag, he lowered the red flag and slowly returned it to the bed of his truck and grabbed the green flag and raised it up. The race starter stated that he observed that all of the aircraft were running and at the scheduled take off time, he dropped the green flag. He observed the front row start their take-off roll and immediately observed Race 1's propeller stop, and the canopy open. He then observed the third row of aircraft taking off and approach the second row, followed by the collision between Race 11 and Race 1. The flagger, who was positioned on the second row as depicted in figure 1, reported that everything seemed to appear normal leading up to the race start. He observed the second row "Red Flagger" hold up one finger indicating the one-minute time hack and then getting a firm thumbs up from each of the two pilots positioned in the second row. The flagger stated that his attention then turned to the Reno Starter Position, who was located past the front row of aircraft and that he observed the green flag being raised and the red flag being lowered; he followed by raising his green flag. Seconds later, the Reno Starter dropped the green flag and he followed by dropping his green flag drop in sequence with the Reno Starter and proceeded to run several yards back to clear himself away from the runway. The flagger stated that when he turned around to view the runway, he saw Race 1 stationary on the runway and Race 11 directly behind his position. A second later, the collision occurred. Examination of Race 1 revealed that the upper portion of the rudder and vertical stabilizer were separated. Multiple propeller slash marks were observed on the right wing, which was partially separated. Examination of Race 11 revealed that the left wing was structurally damaged, and the left main landing gear structure was compressed upward through the wing structure. Multiple recorded videos of the accident were provided by various witnesses located on the taxiway or the ramp. One video, captured from a vehicle located on the taxiway adjacent to the third row of airplanes, revealed that a golf cart with a red flag attached to the back of it, drove from the runway edge into the rocky infield between the runway and taxiway to an area abeam the second row about 13 seconds prior to the race start. A flagger, standing near the edge of the runway, was observed raising a white flag and moving it downward, signaling the start of the race to the third row 3 seconds later. As the third row of airplanes began their takeoff sequence, the car began moving forward, abeam the third row of the airplanes. The video showed that at the time of the impact between Race 1 and Race 11, the golf cart that had the red flag attached to the back of the seating area was parked in the rocky infield, and the flag remained attached to the golf cart. Shortly after, the video panned forward briefly, providing view of the truck, where the race starter was positioned. No flags were observed being displayed at the race starters truck. Onboard video from Race 1, revealed that the camera was mounted in the forward area of the cockpit, providing video of the pilot, and surrounding runway environment, including the third row of airplanes and flaggers adjacent to the third row. About 4 seconds from the start of the video, the engine was heard running erratically. At 11 seconds, the pilot was observed looking to his right and began shutting down the engine along with starting to open the canopy 2 seconds later. Between 16 and 17 seconds, the canopy was opened. At the same time, a flagger was observed on the ramp side of the runway, dropping a white flag, signaling the start of the race to the third row. At 25 to 26 seconds, airplanes were observed passing on both the left and right side of his position, followed by the left wing and landing gear of Race 11 colliding with the empennage and right wing of Race 1 about a second later. It was noted that during the 10 seconds from the canopy opening to the time of the collision, Race 11 was observed drifting slightly left during the takeoff roll. Onboard video from Race 11, revealed that the camera was mounted behind the pilot's left shoulder, providing a view of the left side of the engine cowling, left wing, small portion of the left side of the cockpit and instrument panel, along with the left side of the runway, which included Race 69. About 1 minute after the start of the video, Race 11 and Race 69 were observed starting their takeoff roll. About 11 seconds later, the left wing was observed striking Race 1. During the 11 seconds of the takeoff roll, Race 11 was observed drifting slightly left. 1. The red flag will come up at T-5 minutes. It will be replaced by the green flag at T-10 seconds. Drop of the green flag signals the start of the race. 2. The race starts when the starter's flag drops. The starting time for all aircraft will be taken from the time the first aircraft crosses the start line, in flight, after the scatter lap. 3. Premature starts within 5 seconds will be penalized 30 seconds but the race will not be stopped. Starts earlier than 5 seconds will result in disqualification. 4. All rows will launch simultaneously. Anyone aborting take-off will abort straight ahead and attempt to clear to the end of the runway expeditiously. There was no additional guidance outlining abort procedures in the event of a rough running engine prior to the start of the race. According to the Director of Operations of the International Formula One organization, three briefs were conducted the morning of the accident. The third brief, which was held at the end of the runway, covered various items including positioning of the airplanes for the takeoff grid, startup procedures, and abort procedures. The Director of Operations stated that they discussed with the pilots that once the green flag drops, if the pilots are experiencing engine trouble they were instructed to hold their line on the takeoff grid and roll out [to the end of the runway]. Figure 1: Formula One Staggered Race Start Diagram with Race 1 and 11 and Flagger Locations Depicted. On September 18, 2016, about 1118 Pacific daylight time, a tailwheel equipped experimental amateur built (EAB) Hoover Arnold AR-6, N616DH, struck a tailwheel equipped EAB Reberry 3M1C1R, N913FT, during takeoff roll on runway 8 at the Reno-Stead Airport (RTS), Reno, Nevada. The airline transport pilot, sole occupant of the AR-6 was not injured and the airline transport pilot, sole occupant of the 3M1C1R, sustained minor injuries. The AR-6 was registered to the pilot and was operating as Race 11. The 3M1C1R was registered to Hot Stuff Air Racing LLC., Kissimmee, Florida, and was operated as Race 1. Both airplanes were operated by the pilots under the provisions of Title 14 Code of Federal Regulations Part 91 as an air race flight, which were originating at the time of the accident. Visual meteorological conditions prevailed and no flight plan was filed for either airplane. The pilot of Race 11 reported that he was positioned in the middle of the back row of the staggered start sequence for the Formula 1 Race. When the green flag dropped he initiated his takeoff roll and that as the tail of his airplane came up, he observed Race 1 stationary on the runway at his 12'oclock position. He swerved in an attempt to avoid the airplane, however, subsequently collided with Race 1. The pilot of Race 1 reported that he was in the number four position (middle row, center) in the starting grid, which was the middle inside position with three aircraft ahead of him in the front row, one airplane to his right, and three airplanes behind his position. The pilot reported that about 20 seconds before the green flag dropped, the engine was not running correctly and he shut it down and signaled the starters to halt the start/takeoff process. Shortly after, Race 11 struck Race 1. Postaccident examination of Race 1 revealed that the upper portion of the rudder and vertical stabilizer were separated. Multiple propeller slash marks were observed on the right wing, which was partially separated from the fuselage. Examination of Race 11 revealed that the left wing was structurally damaged and the left main landing gear structure was compressed upward through the wing structure.